A high performance .18 size engine specially adapted for a marine environment. 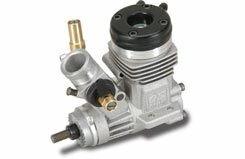 Features twin ball races with a ringless piston/liner assembly for smooth power output and long life. Capable of delivering a massive 1.35PS @ 28000RPM. This engine is supplied without flywheel. O.S. quality comes as standard. 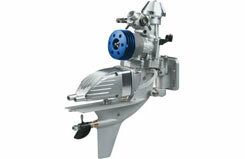 A high performance .18 size pull-start engine specially adapted for a marine environment. Features twin ball races with a ringless piston/liner assembly for smooth power output and long life. Capable of delivering a massive 1.35PS @ 28000RPM. This engine is supplied without flywheel. The new O.S. 21XM is a high performance outboard engine designed for use on the latest high speed racing boats. 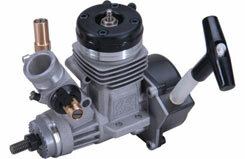 With 1.3PS @ 25000 RPM on tap, this engine provides astounding levels of speed and performance. Features robust cast construction and an integral silencer box. Perfect for the serious racer. Take down the competition with the 21XM Version II Outboard Marine engine from O.S.! 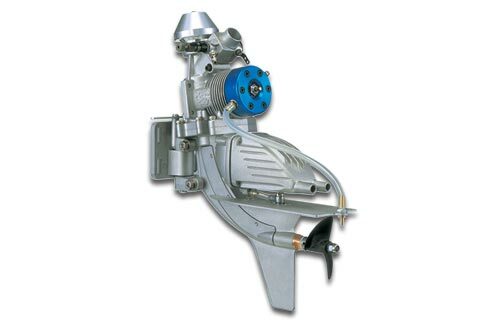 Designed expressly for small and medium sized outboard boats, it retains many of the features found on the successful 21XM, including the 20J carburettor and #8 glow plug. New additions include efficient air cooling, a larger muffler, aluminium tilt transom mounting plate, outboard unit with flexible propeller and blue anodised aluminium heatsink head. The Complete Outboard Unit ! !